Alicia Haywood joined Emergency One in September 2014. She graduated from Ulster BOCES in June 2014. Alicia started with a part-time position and then moved to a full-time LPN position here at Emergency One. 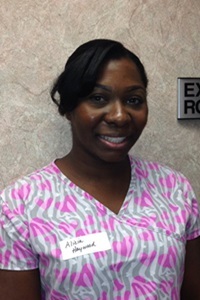 While working at Eone, Alicia is continuing her education by pursuing her RN degree. In addition to urgent care, Alicia is certified as a breath alcohol and drug screen technician, qualifying her for DOT and non-DOT testing. In addition, she conducts pulmonary function testing, audiograms, FIT testing and other occupational health services. Alicia has been coming to E1 since her childhood and has always admired the professionalism of the staff. Now that she has joined our team, she is fulfilling her desire to help others. When not working she enjoys time with her son, watching movies and shopping.